Remember the reversible Crossover Flounce Dress by DbCA? I can’t get my girls out of these dresses! 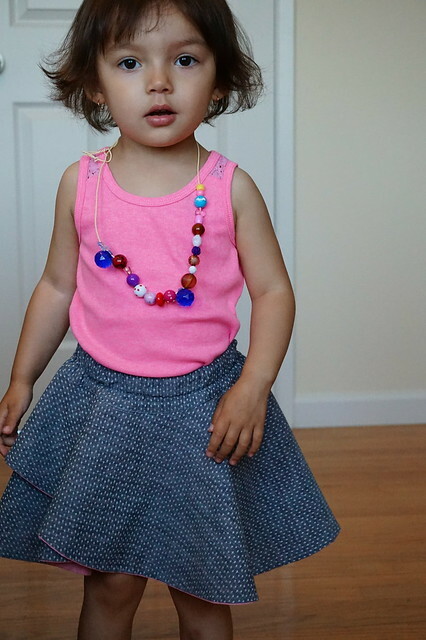 It’s pretty funny, my little one calls it her “tutu dress” because it twirls. Ironically she can’t really get it to twirl well because she spins sooooo slowly. It’s sloth-like really. Well, to make things even sweeter than a reversible dress, Ajaire, from Call Ajaire, released a skirt hack using the same flounces as the dress pattern. 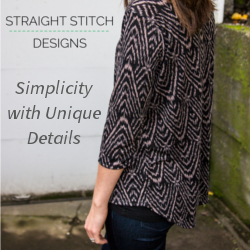 You can find the tutorial and pattern pieces on One Thimble today. This is a seriously quick and unique skirt. I really love that it’s not just another gathered skirt. It’s casual, and depending on your fabric choice, can be made quite fancy. 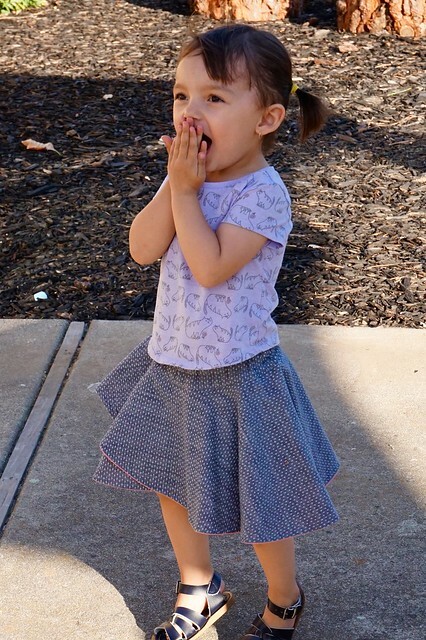 The fabric I chose for this skirt is a lightweight chambray and a pink quilting cotton. The drape is ever-so-slightly structured, but I like the movement of the flounces when she moves around. Gives you an idea of what twirling would look like, you know, if she could actually twirl. 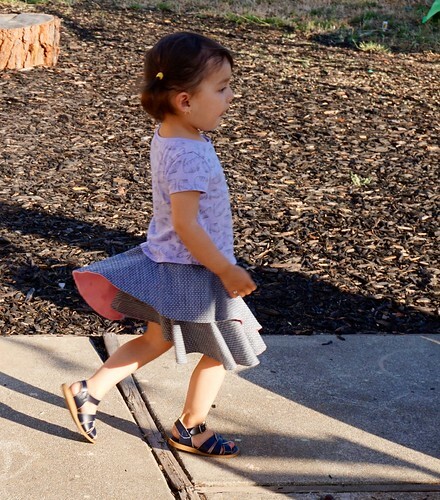 “Mama, I can twirl. 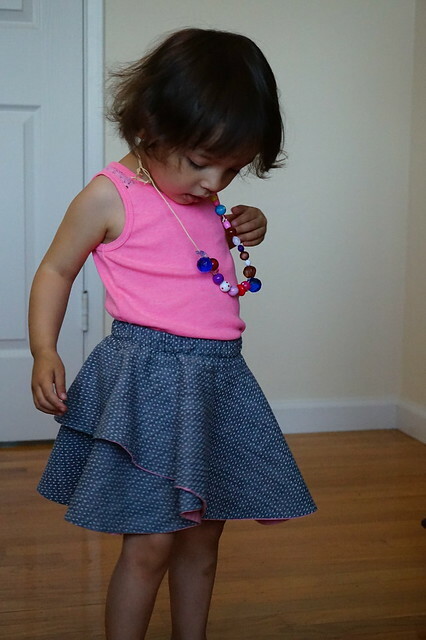 In slow motion.” She loves this skirt too. I can’t get her out of it! It’s already stained in way too many places!!! Did I mention the skirt is also reversible! I need more of these, seriously. They’re so fast. I can see little pompoms at the bottom of my next one! Do you have any fun reversible patterns? Talk about capsule wardrobe! Hi, I'm Gina! Thanks for visiting my blog and poking around my makes. I've been sewing for 25 years and blogging for only a few, and I love being a part of this amazingly creative community!